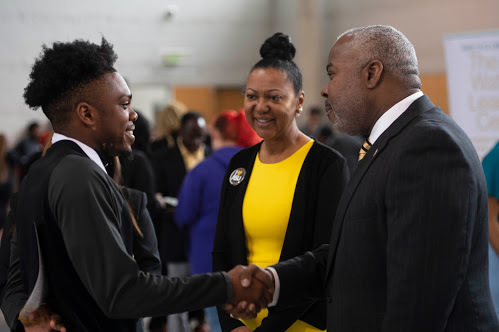 The second week of the Alabama State University President’s Tour, which kicked off in Birmingham on April 8, was as energetic and exciting as the first leg. The tour journeyed to five cities in Alabama during the week, visiting Carver High School and AH Parker High School in Birmingham, Selma High School in Selma, Frances Marion High School in Marion, Gadsden High School in Gadsden and Jeff Davis High School in Montgomery. ASU President Quinton T. Ross said the tour started on an impressive note and ended with overwhelming response. To keep to that mission, on-the spot scholarships were awarded both weeks of the tour. Students also were able to submit test scores and transcripts onsite and had a chance to qualify for potential scholarships. One key part of the second leg was signing an important Memorandum of Understanding (MOU) with two community colleges – Lawson State Community College in Birmingham and Wallace State Community College in Selma. The MOU provides a pathway for students who have achieved their two-year or associate degrees to enroll at ASU to attain their bachelor’s degrees. The University has signed a total six MOUs over the past month. At each tour stop, President Ross inspired ASU pride and made a great case for why students should choose ASU. Ross said people around the world know and love ASU because of the excellent professors and staff at the University who have helped thousands of students unlock their potential and find the path of their dreams. “That story still needs to be taken everywhere we can take it. This is a remarkable institution known for producing outstanding students,” Ross said. Ross and his road team of students, faculty, staff and administrators were greeted by enthusiastic crowds at each tour site. High school bands and cheerleader squads ushered in President Ross and a parade of others representing the university. One of the most emotional moments came when the tour stopped in Marion, Ala., the birthplace of Alabama State University. Students were lined up, the band was playing and spirits were high. “As we drove up to the school, we were greeted first by a throng of enthusiastic students from Marion Elementary School. They were waving handmade signs and banners and chanting ‘AS-AS-AS-AS-U!’ As one of my former professors used to say, I became ‘commotional,’ which is a little beyond emotional. We were truly welcomed home,” Ross said. 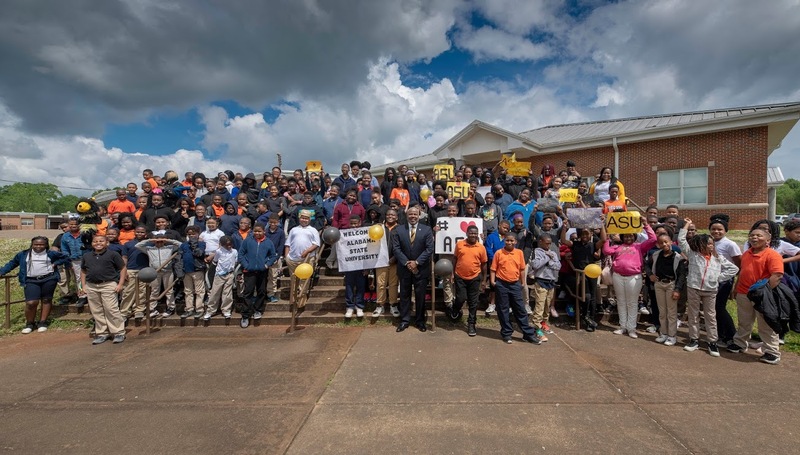 The welcome and emotions continued that afternoon as Ross and the team had the opportunity to tour the Lincoln Normal School Museum which houses memorabilia related to the historic school for African American children that evolved into what is known today as Alabama State University. The week also included evening receptions that provided opportunities for engagement with alumni and other friends of the University. Members of the Gadsden chapter of the National Alumni Association joined the tour at Gadsden High School. At the reception in Huntsville, attendees viewed Nike’s new documentary on the Honey Beez and heard from band director, Dr. James Oliver. They also met the members of the University’s Rover Challenge Team who were in Huntsville to participate in a national competition. 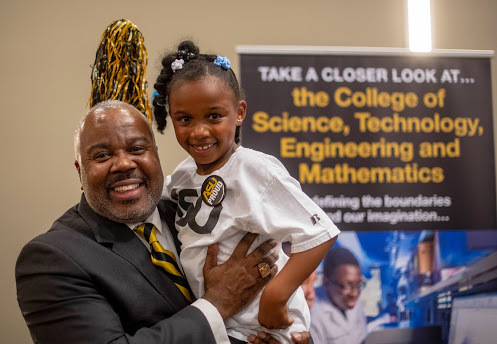 Friday, April 12, Montgomery Metro Alumni Reception: Alumni from Montgomery, Elmore, Autauga, Lowndes, Macon and Bullock counties were invited to join President Ross for an evening of Bama State Spirit from 6-8 p.m. in The ASU Stadium Club Lounge. 10 a.m. College Fair in The ASU Stadium. Attendees had an opportunity to meet with faculty, staff and students from ASU’s colleges, as well as representatives from the Office of Admissions and Recruitment. 11 a.m. Black and Gold Game at The ASU Stadium. Area high school students and their families, as well as community members, were encouraged to join the Hornets for the annual Black and Gold spring football game. Everyone was encouraged to wear ASU gear. Freddie Williams, director of ASU Admissions and Recruitment Office, spearheaded the tour.